The Climax Blues Band moniker has existed since 1972 when after 5 years as a blues-rock band they quietly dropped the Chicago part of their name to reflect a broadening of their musical palette. The band subsequently moved its musical focus to radio friendly material for the American market and it wasn’t until Colin Cooper reformed the band in 1986 that they returned to the blues – albeit they cut the commercial, but impressive’ Drastic Steps’ 2 years later. 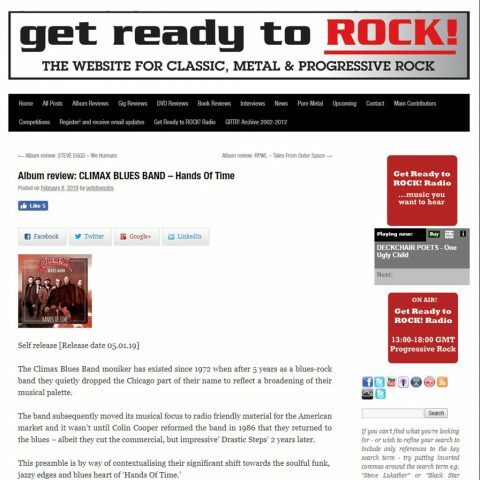 It’s an aptly titled album that that reflects both the passing of the band’s former leader Colin Cooper, while offering a key to a mellow song-driven set on which vocalist Graham Dee and sax player Chris Aldridge make the most of the grooves that the stellar rhythm section of bassist Neil Simpson and Roy Adams offers them. The band sets itself a high standard on material that evokes the white boy soul of Michael McDonald on track such as ‘Flood Of Emotion’, the funky title track and ‘Wrong Time’, which builds imperiously to an angst ridden hook. Dee is an excellent choice as vocalist. He has the timbre, range, versatility and expressive phrasing to lean into a succession of grooves while elucidating lyrical expression. His faux baritone husk on ‘Ain’t That A Kick In The Head’ sets the standard for a laid back album which washes over you with a soulful funky hue. The signature sax and guitar double lines are that of the early 70’s band, while ‘Straight Down The Middle’ is the kind of smouldering funk that sounds not unlike the latter day Steely Dan, and is a good example of the album as a whole. Dee also comes as close as possible to Colin Cooper’s vocals, as evidenced by the closing bonus track. Significantly the bonus track could almost have come from the same session as the rest of this album, which kind of justifies the band’s current musical direction. What’s missing is some better sequencing, as the album cries out for an uplifting track in sharp contrast to a succession of mid-tempo tempo funky songs. Guitarist Lester Hunt is also relegated to playing parts, as he only really stretches out with an incisive solo on ‘Straight Down the Middle’ and some crisp-toned licks on ‘Faith’. He’s at his best on ‘Hard Luck’, which significantly is the album’s only shuffle. Both he and keyboard player George Glover are pushed higher in the mix, as Dee attacks the song with real grit. It’s the kind of track that belatedly returns the band to its bluesy roots with some signature sax and guitar double lines, before Aldridge’s grainy toned solo weaves its spell. You can imagine this being a live favourite. And it’s Aldridge’s mix of rich sax tones and imaginative solos that dominates this album. He’s both a stellar soloist and intuitive accompanist. He’s the featured soloist on the New Orleans influenced musical departure of ‘Top Of The World’ and he’s in his element on the gospel tinged ‘My Music’. His signature riffs, rich tone and vivacious solo give the song its colour, while his jazzy intro to the title track gives the song a noir film feel. He further adds a sinewy ‘early hours’ solo to offset Dee’s whispered rap on the atmospheric ‘The Cat’, as he sails over Glover and Hunt’s gently voiced accompaniment, while Adams pushes the groove. His gritty attack on ‘17th Street Canal’ leads to a perfect drop-down finish with a solo sax outro, while his perfunctory stabs and deep in the alley funky lines on ‘Faith’ illustrate the way his playing illuminates a song. The album finishes with another highlight called ‘Wrong Time’, on which the ensemble rise to the occasion, as Dee’s impassioned vocal draws one last surge from the band before an all too soon fade. Hands Of Time’ is a brave step forward.